A look at the Icelandic Horse with Kim Logue - a reprint from an article a little over one year ago. The Icelandic horse, in Iceland, is usually left wild, living outside in a herd, until about age four. So they learn to find their own footing and their own way to survive and thrive, at the edge of the Arctic Circle. They roam a volcanically active hotspot, amid very rugged fjords and an inspiring mix of magical glaciers, heathland, hummocks, lakes, rivers, waterfalls, and hot springs. With sparse vegetation, and not many trees to break the high winds and vicious loose volcanic sand, grassy areas are treasured. The special ponies embedded in this landscape are like a lot like the Icelandic sheep (which seem quite mountain goat), and are a unique force in nature. It is important to understand the terrain that has shaped this amazingly-sure-footed breed. I would ride over rocks like this, with horses like these, any day. Or night! The sun didn’t even go down. You may have heard that in Iceland, they ride as fast as the terrain allows. But you need to comprehend the challenging geography, and the fact the treks go on at top speed, by non-Canadian standards, for hours and hours and hours. Recently, I went on a “Riding and Relaxing” Iceland By Horse trek. 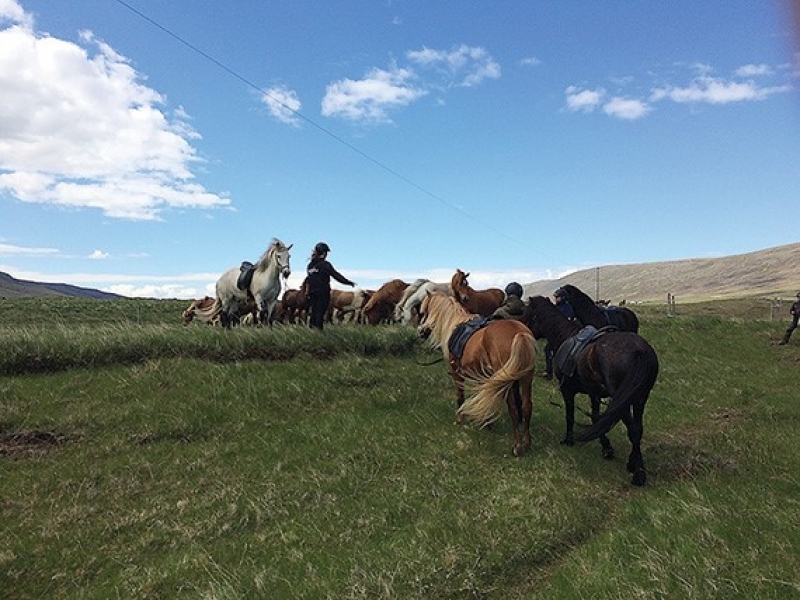 As part of a group of six riders, with four guides we travelled with a herd of about 30 horses. On our second (and easiest) day, we went riding 14km over the steep ridge between two valleys. It gave us a great view over the lake Skorradalur and, since it was a clear day we could see the glacier at Snæfellsnes. The scenery was truly magical, but truth is, I couldn’t bear to really look around. I kept my eyes focused on where I wanted to go, with a fake smile on my face, in an effort to relax myself and my mount, because the turf felt so treacherous. I was exhilarated yet terrified. After riding the along edge and ascending the incline for hours, with our group of horses, and even some sheep, the guide shouted back to me, "Just go up!" He had to tend to the offshoot herd of 4 horses that were heading off a different direction than the rest. So, I turned my horse directly right and we proceeded smoothly straight up the mountain, where there was no path, just steep, rocky slope. I could not begin to tell the horse how to manage such ground. At home I would have considered it unsafe to ride over such ground, but I had no choice but to trust my mount, I held on, trying not to get in the way and praised the pony. It was was amazing how quickly and easily the horse handled the footing and arduous slope, carrying me up the mountain to join the rest of the herd. I thought we would stop at the top for photos but, we kept proceeding at quite a pace, down the other side, a rocky ridgy slant that “civilized people would dismount and walk down.” I couldn’t believe how steady the horses could make such rough domain. Guide: Guðmundur Ragnarsson. What might appear in these photos as some sort of man-made hiking trail is actually a network of paths forged by sheep treading the routes. What might appear in these photos as some sort of man-made hiking trail is actually a network of paths forged by sheep treading the routes. Did you know Iceland was where astronauts first went to “train” and prepare for the moon?! If the wind dies down, the gnats rise up. It is often rainy or misty and cool, even in summer. I think that’s why Icelandics have evolved such heavy manes. It is clear too, that the difficult climate has also shaped their character. I found them, tough, hardy, athletic, independent, spirited, friendly, and adaptable. Willingly carrying large men, over such a landscape, at such speeds… and in very, very smooth gaits. I think the running walk, their tolt, needs to be experienced — especially in such a setting— to be believed! There is high action in front and power coming from the hind end that is incredibly comfortable for the rider. It might also surprise you how rocky ditches or streams are run over or through, instead of jumped over. What was also enthralling was the unique experience of running with the loose horses alongside. For the occasional vehicle, it was obviously common to slow for livestock on the roads. Generally, in the areas we rode there were very few cars, or bikes or motorcycles or dogs or people or anything. I noticed that the horses didn’t spook both because of their remote surroundings but also because of their steady personality. Beware the chaos and confusion that can be caused by intermingling with neighbouring herds of horses though! It is important to know that disinfection precautions are necessary, because there are no contagious animal diseases in Iceland. Used riding gloves, whips, tack and other leather gear from elsewhere may not be brought in to the country. And, trust me, for rides like this, proper riding gear is just as essential as horse shoes for the equines! Also, based on this experience, it is fair to say that an 'easy' horse in Iceland might be too much horse, with too little training, for many, by our North American Standards. So, make sure you do research before deciding which horse adventure might be right for you. If you decide to ride in Iceland and it will be easy to find fine horses and to ride on incredible terrain and you can go really fast for miles and miles and hours and hours without stopping. You will surely enjoy their five natural gaits, and their personable endurance, power and spirit!